Yes, Olivia was right. “mommy cute”. By the way….we are only days from getting our hands on the final video from her memorial service, I know there were so many of you that wanted to get a copy. I will make them available for a donation to AoH (the way she’d want it) in the very near future. Thanks for being patient. Ok, so it has been a long week. I can’t even tell you how much is going on in Anthem of Hope world. Tomorrow is our casting call for a video ad compaign we are doing. We have like 30 actors coming in to audition. Should be good. Also, I got a call from the video editor and it looks like the video from Misty’s service will be done this coming week. I’ll need a bit of time to get it onto a DVD and have them printed, but it is coming very soon. Speaking of Misty….I did talk about her today with Olivia. We talk about her often, usually Olivia says something. Today she saw her picture on the wall and said, “Mommy’s in heaven?” to which I of course reply, “yes honey, she is.” This was followed by her blowing of a kiss to the sky “I blow mommy a kiss”. I often let her climb out of her carseat when we are parked at home. She comes and sits on my lap so that she can draw on the windows. The condensation makes for a good marker board. Well, today she noticed that the windows were ready for her artwork and she said: “it do got sation on it” meaning “it does have condensation on it”. This is important because sometimes we can’t partake of this ritual due to the lack of said “sation” on the windows. Another funny thing is that she can’t quite get the “sp” sound out right. If usually comes out as an “f”. Now, I recently bought a large white board for my living room (i know i know…but we have Anthem of Hope meetings many nights after my girl goes to bed and I need a white board!) and we often draw on it. Well tonight I wrote “L-I-V-I” on the board. She walks over and says “L I V I – that fells my name”. Despite being happy that she finally recognized the letters without coaching, I was sent into an roar because of how cute she was talking about “felling” her name. I am so in love with this kid….I adore her so. Anyway, I need to get to bed. Tomorrow should be fun. Tonight seems like a bit quieter than many new years eve’s. The big 2008 seemed to just retreat quietly without as much attention as usual. In light of that…there is something I’m finally bringing myself to write about. It’s not a theological discussion, so let’s stay away from that…just something that is on my heart often. We all know that I think the world of my Misty. She was an extraordinary woman…for many reasons. And one of those reasons is that she was amazingly discerning. She always knew things that other people didn’t pick up on. She seemed to have perhaps a sixth sense, if you will, about many things in life. In the final few weeks of Misty’s life, she began to act differently. She would run her hand down the back of my neck, more affectionately than usual. She would make eye contact for longer as if she wanted to say something, but the words weren’t there. And she would sit and watch so intently as Olivia would play. It was as if she were drinking in every moment…cherishing every smile and every laugh. When we were in the hospital that first day of her last stay there, she was in and out of consciousness all day. When she was awake, she wasn’t able to do much…but she rubbed my hand. She held my hand and moved her fingers around as best as she could. A couple times during the day and during the night she’d wake and rub her hand on mine for as long as she was awake. The next morning she went into a seizure and came out in a coma. Her hand rubbing that night was the last communication I got from my best friend. I didn’t know it then, but I believe she was saying goodbye – all those last few weeks, just saying goodbye. I believe she was saying that she knew it was time and that I shouldn’t worry. It seems clear now. I remember that she tried to tell me she knew she was going to die – it was only a few weeks earlier and she wanted me to guess at what she was thinking (she couldn’t talk at all) and that is where we ended up. I basically ignored that and told her we were believing God for a miracle. But she was a step ahead of me. She trusted God so intimately that she was ready for whatever was next. She wasn’t stuck on needing to be on this earth anymore..she was ready to be used by God in whatever capacity he chose…whether in life or in death. It was the extension of that faith that stirred so many of our hearts. So, as we quietly say goodbye to 2008, I can’t help but remember another goodbye of 2008. A parting that, unlike this evening’s expected calendar change, cannot be characterized as quiet, expected or usual. As Misty slipped away, she wasn’t able to physically say anything at all, but her life spoke so loudly and served as an example for many. She is missed tonight and every night of the year, but I’m so thankful for the years I did have with her and for the legacy of faith she has left for me, for Olivia, and for many of you. 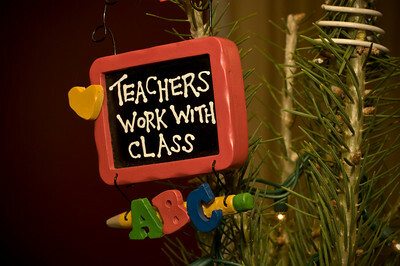 It has been a slightly rough few days, but not because of Christmas. I know everyone expects the holidays to be hard for someone that recently lost a loved one, and I do totally understand that idea…but that hasn’t been the case for me. Christmas was a good day and no harder than any other since losing Misty. 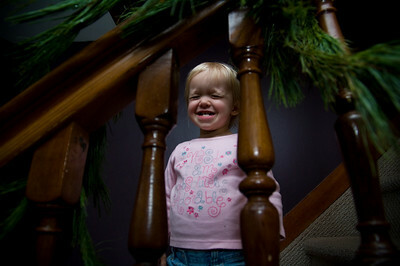 For me, the hardest part of this season has been Olivia’s birthday present: her new room. time planning a new room for her that will provide space for her to play, read and learn, rather than just sleep and get changed. I spent a bunch of nights up late, sketching out where new furniture was going to go and what the room was going to look like – and buying stuff online. This was the hard part. If Misty were here, this past week would have been potentially the highlight of our married lives. She loved Olivia more than anything and doing something big like this for her would have just made the year. Nevertheless, the room is done and today we had a party for my little lady. Unfortunately, I cannot find my wide angle lens for anything. It would have let me get a nice shot of the whole room from one of the corners. Instead I just have a few shots that show you little areas I wanted you to see specifically. Oh and before I get into pictures, I would be remiss to not mention my Extreme Toddler Room Makeover team. Kelsey gets the prize for spending 2 entire days (like 12 hours each) with me painting and the such. Colleen gets a kudos for helping me create the color scheme and overall design. Genevieve, Taylor and Kyleigh were the first rate production crew you wish you knew. My dad was the hero with the hammer and drill and mother-in-law with the sowing machine. Seriously, this was just a reminder that I’m really blessed to have such great people in my (and Olivia’s) life. Basically, everything is changed in the room. We went from a crib to a toddler bed, replaced or painted all the furniture and went with a brown and pink color scheme. The strange pink thing hanging from the ceiling is “daddy’s chair”. I wanted to have a bean bag chair to sit next to her when she is on her new pink comfy chair. There was no good place on the ground, so I hung it. I wanted to show you this because it’s my favorite part of the room. 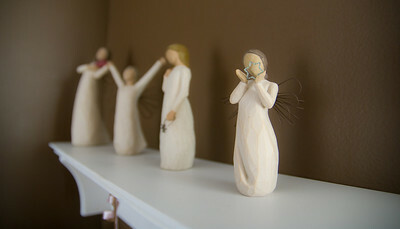 The first two angel figures (from left to right) were from Misty’s collection and the second two are more recent. The meanings of each form a timeline of Misty’s life and death: Love, Courage, Remember, Shining Star. It’s a artistic way of representing Misty’s life and legacy for Olivia. 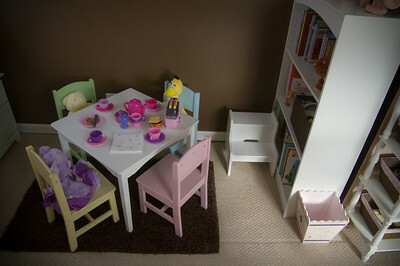 Olivia now has her own little play room, with a dining table (with tea and toast set) and her own bookshelf and toy chest (on the left – out of the picture). She loves being able to get her books off the top shelf with the little step stool. If you can’t tell, this furniture is really small…it’s pretty cute. And I’m far from being one to create a “shrine” for someone…but I thought it was good for Olivia to have a couple pictures of her and mommy. 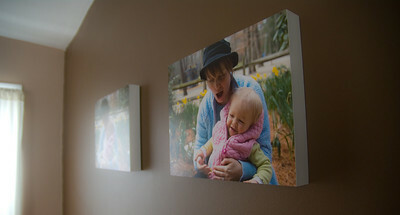 These are called standouts and they are glossy prints mounted by the lab onto a 1.5 inch foam-board. That’s all for now (till I find my wide angle lens and can take a good picture of this room – I’m so annoyed about this. I lose everything). You can see the rest of the pictures HERE. I am home from work this week, but my focus is on Anthem of Hope, Olivia, and cleaning. So, I might not be around the blog much this week. But, I’ll be back. Thanks for reading…really. Also, to the person who emailed me “from a monthers perspective”. I’m am olivia’s “mother now…and I do have that perspective much more than you’d think. The bag weighs like 1 lb…I’m not too worried about it. Thanks for your concern though! I had it in my head that I was going to record an acoustic version of a traditional christmas carol for you all tonight….but since its 2:49am and I’m just finishing everything else I had to do, I don’t think we are getting to recording a song. Anyway, I’m not feeling particularly articulate tonight. I’m just worn out overall and falling asleep here. 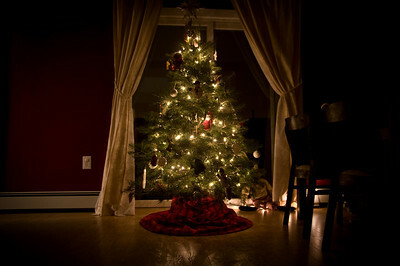 I want to say Merry Christmas to all of you though. I really am so appreciative of the love and support many of you have shown me and my family. You are paramount to God’s continued encouragement and peace in my life. Thank you. Before i go, I wanted to leave a couple images. 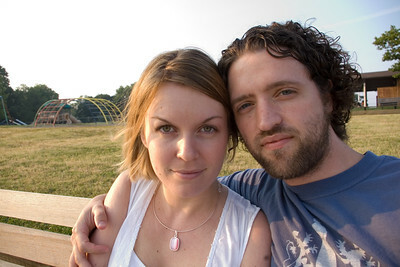 Here are a couple from our 4yr anniversary (june 2007). And one more. This is one of my favorite images ever. Misty was a great mom. I do miss her a ton. Ok, so that’s it for now. I really hope you all have wonderful days today. I’m completely ashamed at how long it has taken my to get to this second set. The goal is still to be weekly…so I am calling this week 2. Spending 4 out of 6 weeks in arizona had me fighting for time when I was home. I just didn’t get to the picking out of cards and the scanning them in. Oh well…here we go. In response, Misty wrote: I know that God allows faith tests in the form of temptations, problems and difficulties, to drive me into his word so I can learn His truths in deeper ways. I like this one because it talks about affliction, but was definitely written before her first run in with cancer, or any major affliction as we would think of it. If I had to guess, I’d say this was circa 1998 (she was probably 17 yrs old), definitely before her first brain surgery in summer of 2000. The truth in this verse became more real as her life progressed, but even at an early age she noted it and found ways to apply it to her life. If you have been around for a while, you have seen me write about how much we have learned through this struggle and how God brought Misty to such an amazing point of faith in him. I can’t deny it. I can truly attest to this verse. As Misty walked through affliction, I was there with her – and without any question, we learned God’s decrees. This is not just his promises, but also his law. I live/love/serve better today because of Misty’s affliction. And I hope I don’t make her sound like a leper…she was not. Misty took the pains that were handed to her in so many areas, and as beautifully and graciously used them to make herself better. The challenge here is that we make good use of the “afflictions” in our lives. We should not waste these opportunities to let us turn to the Bible. 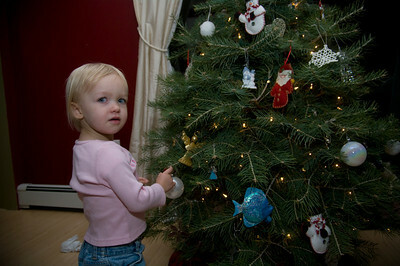 This year Olivia was much more of a help than she was last year. She loves “helpin”. The blue fish on the bottom there is Rainbow Fish. He is the character from the story we used to read every night at bath time. 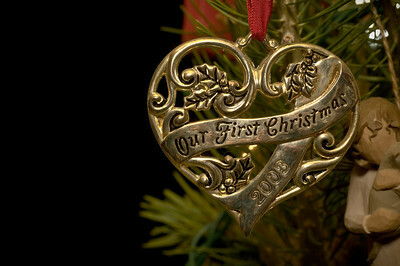 Misty and my first Christmas married was 2003…this was our ornament. 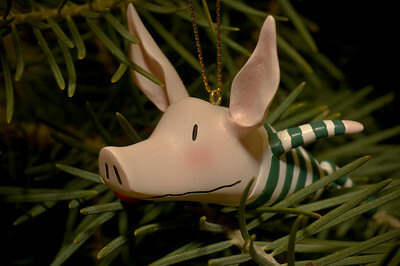 It’s on the tree this year. I decided when I came back to work that I wasn’t going to be a workaholic to “ease the pain” of losing my wife. So I force myself to have alone time to think, pray, grieve, muse…and even just linger on the images, feelings, touches, laughs and dreams that I remember. I am sitting in a friends house in Sedona, AZ. No one is here and they let me stop in for the night for a break from my 2 weeks of 16-20hr days in the desert. I’m sitting in front of the fireplace and I can’t sleep. So I decide to check out the “observation deck”. I walk out the master bedroom and up a spiral staircase to the roof. Wow… I’m standing there in my socks, not even caring that its quite a bit colder than comfortable. My breath is taken away. The sky is so rich; I can see Orion, Ursa Major, Pleiades, Sirius, and a billion constellations and stars that I couldn’t dream of knowing. But, one group stands out from the crowd. One whose significance is even brighter than is brilliant appearance: Cassiopeia. Cassiopeia was a queen in Greek Mythology, who is noted to have unrivaled beauty. And the northern sky boasts the mark of this queen. It is unmistakeable as it consists of 5 bright stars forming the letter “M”. When I was 16, I was backpacking with my brother and my dad. I spent a few hours out under the stars and couldn’t keep from noticing this formation. I had fallen in love with a girl named Misty and this large “M” in the sky became the subject of my poetry for her. In later years, I’d always point out her constellation as we walked hand in hand on the beach or sat outside under the stars at night. And tonight, once again, Cassiopeia becomes the subject of my writings. Today though, its significance is for me, and even you…not for her. The symbol of Cassiopeia is a heavenly mark of my beautiful Misty; an emblem of the beauty, grace and brilliance of my lady; my lady whose life shined as bright as those stars. Tonight, under the gorgeous Sedona sky, I saw Cassiopeia for the first time since well before Misty died…and instantly it took on a new meaning. It reminded me of the myriad lives that were made a little brighter because of my shining star. I’m so proud…and so sad. Yet, entirely content for tonight. I went on a date today. I picked her up around 5pm at her friend’s place. After some deliberation we decided to hit the mall. There were a few things on the list to get, but the objective was primarily just to hang out. We ran into a gazillion people of course and without fail, my lady was the center of attention upon each and every reacquaintance. Usually they gawked at her fabulous leather boots (with the furry tops) or her classy brown tailored pea coat that flared out at the bottom as is of course, best fashion in recent years. Many would continue on about her poise, her articulate language, and even her striking blue eyes. I could tell the girls we ran into were all jealous of her. She even got approached by some folks about modeling. I bought her a huge stuffed animal from the Disney store…carrying it for her made me feel like we were teenagers at the county fair and I had just managed to squirt more water into the plastic clown’s mouth than any of the other testosterone charged pubescent males wielding a high powered water gun. We bought some clothes from Old Navy and got a couple of Auntie Anne’s famous hot Pretzels. From there we hit up Luigi’s in Little Silver. It’s a take-out pizza place, but there are a few tables there. Not a place garnering top marks from Zagat for its decor, but it’s pizza is arguably the best in the area next to the Front Street Trattoria in Red Bank. We shared a few slices and an Arizona pomegranate green tea…one of my personal favorites (hers too). By this time, it was quite cold and the wind was picking up. So as we left, we found ourselves running around the side of the building working our way into a full sprint in that last leg before we got to the car. Here’s the part I love. As we hit the corner of the building and rounded it toward the car, we looked at each other and just started laughing. It was a hearty, full belly laugh like you get only once a year when you go to a Brian Regan comedy show. The kind of laugh that you can’t plan…and you can’t control. The kind of laugh that you dream of having on a first date. It’s the same laugh that I had with Misty so many times. Strangely, this girl is so much like my Misty. We ended up back at my place and I let her in first while I fought the cold to bring my bags in from the car. As I was walking up to the door with arms loaded (I’m a guy, we aren’t allowed to make multiple trips no matter how many bags we have), the laugh came back. The laugh came back as I saw her licking large circles on the window of the storm door. I couldn’t help but laugh – it was such a sight. What a perfect night with a perfect girl. I mean, she’s not even two years old yet, but she is such a blast to be with…just like her mommy was. I’m thankful for so many things. I really have been so blessed through my whole life. But I’m going to forgo the laundry list and tell you something that has been on my mind since before Misty died. It’s not an easy thing to say and it’s even harder to really explain. It’s not a passing thought, but a strong conviction…one that no logic or human reasoning could possibly undermine. It’s a confidence in the faithfulness and enduring love of God. But more than a confidence really, it’s a thankfulness. Yes, I’m thankful for many things…but today one stands out. All of this because of Cancer. Cancer took the life of my 27 year old wife. But today, I’m not angry. I’m not at all bitter. Well, I’m convinced that even in the midst of her dying, God was good…not only to us…but also to her. 1) It was Thursday Sept 18th and Misty woke up to a playful Olivia. 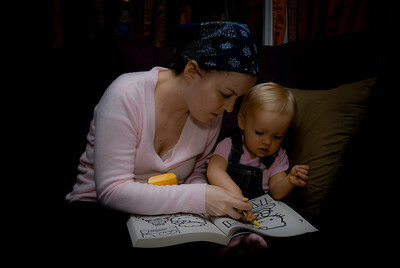 Misty was with it and played with her daughter and ate breakfast. She had trouble communicating, but even on that last day at home…she knew what was going on and had good relationship with her daughter. Misty had a seizure that morning at around 10am. This put us in the hospital. It was just over 20 hours later that her brain stopped working completely. So, with one of the most devastating diseases a human can have, Misty was given a very graceful departure. Just 1 day in the hospital before her brain stopped. 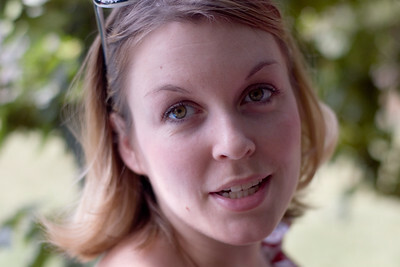 I have friends who will tell you stories of their brain cancer patients….the end isn’t ever quite that graceful. Mist’s departure was painless and quite unlike many brain cancer stories I know. 2) Additionally, it was the very beginning of July that Misty’s MRI showed such bad tumor progression that no one expected her to survive the month. 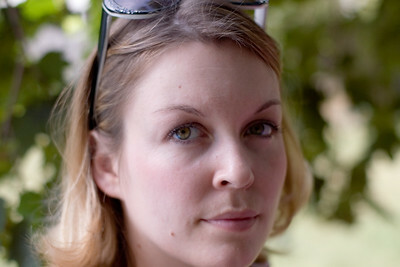 In fact, many patients with tumors less progressed than Misty’s passed away well before she did. For some reason, we were given almost 3 months to spend together as a family. We toured the state of NJ doing everything and anything. I am so grateful for those 3 months home from work to spend with my wife and daughter. 3) Lastly, I believe that God took Misty to a place where she was so intimately trusting in him, that she did not fear death. She was taken to a point of faith that most of us may never achieve. That was a gift to her. How great to be able to be at that place. After being there, I’m not sure she would want to come back to a “normal” life again. I thank God for the gift of faith he gave misty. Cancer was the trial that God used to perfect our faith…to make us “mature and complete” spiritually. So yes, I’m thankful for cancer.